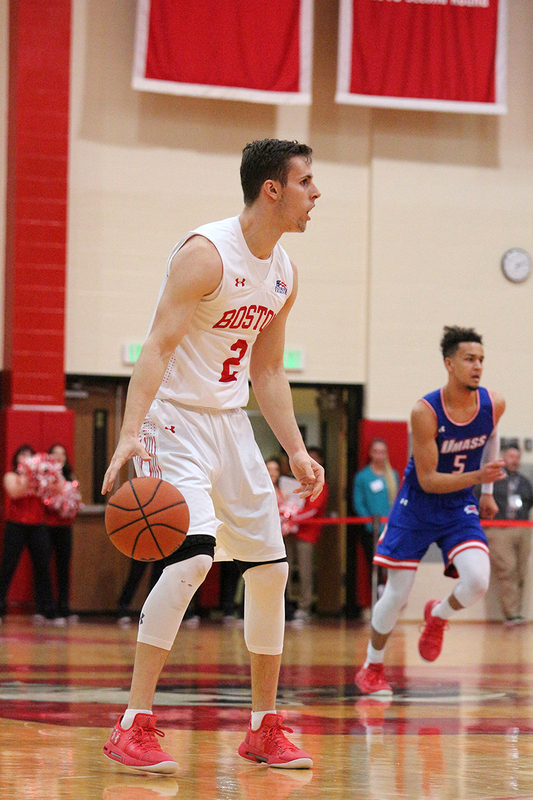 Boston University men’s basketball returned home for its first game at The Roof in nearly a month to face the University of Massachusetts Lowell on Tuesday, where BU (6-4) outscored Lowell (5-6) 45-28 in the second half on its way to a 79-60 victory. After finishing the road trip strong, the win makes it three straight in the W column for the Terriers. BU head coach Joe Jones said rebounding from a slow start aided the win. Although the final score was not close, an eight-point run for the River Hawks within the span of two minutes brought the score to 10-2. A fastbreak from junior guard Tyler Scanlon topped a Terrier push to bring the score to 12-9, but with 13:46 left in the half, Jones brought five subs to the scorers’ table in search of more energy on defense. Lowell maintained its lead until 7:35 left in the half when a free throw from junior forward Max Mahoney tied the game 18-18. BU managed to take a 34-32 lead at halftime. After returning to the court following Jones’ full sub-out, Mahoney got off to a hot start and led the Terriers in scoring. He had 15 points at the break, making seven out of eight shots. Mahoney attributed his production to offensive production throughout the team. Currently, Mahoney leads BU with a field goal percentage of 65.5 percent and improved that mark by going 10 for 13 from the floor for 23 points against the River Hawks. The Terriers production continued to jump through the second half, including four straight good layups from Mahoney, Scanlon and freshman guard Jonas Harper. The lead jumped from two to 10 in just nine minutes, and eventually up to 20 down the stretch. BU finished 31-58 — or 53 percent — from the floor by the end of the game and made 18 shots on 31 attempts in the second half. Coming into the game, Lowell allowed an average of nearly 82 points per game. Even with a slow start, the Terriers’ 79 points followed the trend of the River Hawks’ defensive numbers. Even though Lowell was giving up a lot of points, its 5-6 record was in part due to the River Hawks scoring over 80 as well. However, Lowell was held to 43.1 percent on all shots Tuesday night and just 12.5 percent from beyond the arc, making two of their 16 attempts. Getting 60 points was a new season low for them. Scanlon scored 20 points on 7-of-10 shooting and 5-6 from the freethrow line. After tonight, BU will have nine days off before going on the road to face Dartmouth College, but not before settling into the comforts at home at least for a little while, according to Scanlon. Any news on Walter Wyhte?